Riffs Smokehouse is a USDA certified BBQ Smokehouse headquartered in the trendy Northeast Minneapolis Art District. We are focused on creating amped up competition style bbq in convenient packages that reheat from freezer to table in seconds. We slow smoke all our meats over a blend of Maple Hickory and Cherry woods and then Hand Pull into succulent bark encrusted nuggets. Our products are all natural, Gluten Free, Soy Free, and contain no fillers, additives or preservatives. Our BBQ products are the perfect fit for your fundraising campaign. We have put together an affordable line up of products that make it easy for anyone to feel comfortable contributing to your Organization. Our slow smoked pulled pork is downright delicious, super convenient, and offers a Healthy Alternative over other worn out fundraisers like pizza, candy, popcorn or cookie dough. 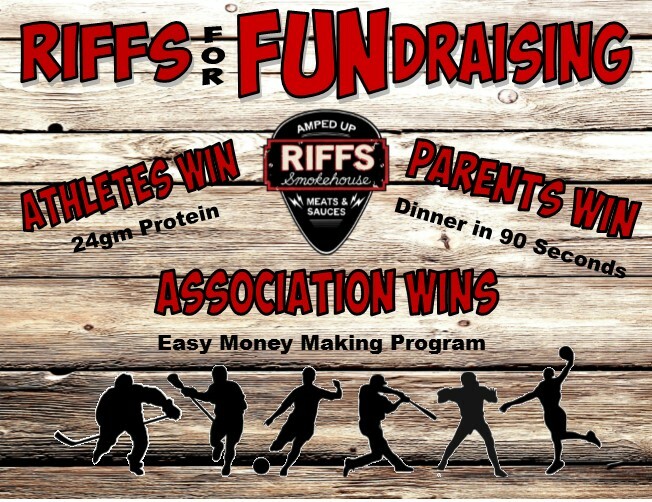 Riffs exciting products can help you achieve a great return for your Organization with minimal effort, and average profit around 55%. We are excited to help you out with you fundraising program. Our great tasting ready to eat bbq products can help you maximize fundraising profits for your organization. The program is simple to implement, easy to understand, and like our products, quick and convenient. There are No Up Front Costs! We provide sales sheets for each seller. Sell, Sell, Sell, collect all proceeds, and prepare your Order. Submit Order and Payment to Riffs Smokehouse. Pay only for the product Sold, you keep the Profit! Riffs processes your order and will have ready for pick up two weeks after order placement. Select a date to pick up your order from Riffs Smokehouse. All orders ready for pick up at the AV Dryland Center on Wednesday, December 7 between 6:00 - 8:00 pm. A smokey, hickory bbq sauce that goes great on everything! A midwest nice hot bbq sauce. Goes great with Beer! Please total your order and enter it here. Credit Card, Cash, or Check (to Riffs Smokehouse) at time of Pick Up. Questions or Requests for Riffs? Thank you for supporting our local, family owned business!